Holland America Line has released new details of its upcoming cruise ship the ms Koningsdam which is currently being constructed in Italy. The ship is set is to be a brand new class for the Seattle-based cruise line and at 88,500 tons will be the very first in the pinnacle class of ships. 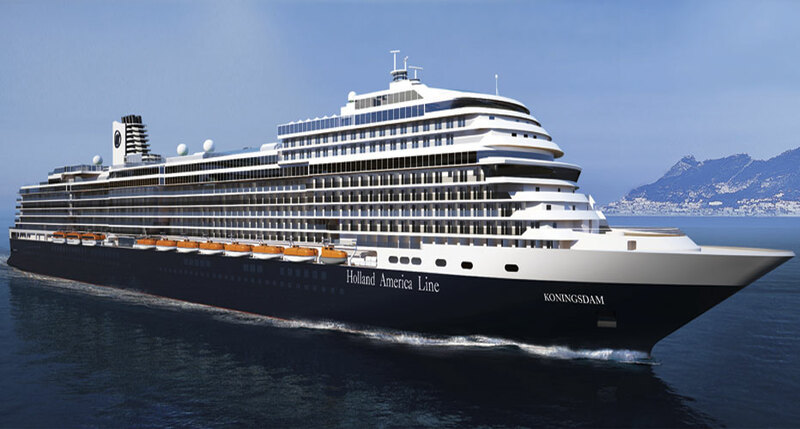 Koningdam is currently being built at the Fincantieri shipyard in Marghera, Italy but once it;s complete will offer the very best Holland America has to offer and more. So before we look at whats to come Holland America have released a video that’s showcases the future cruise ship. We can see renderings of what the ship will look like including public spaces and the vessel it’s self. The cruise line states that the story of the ship will unfold online over the coming months through vibrant renderings, engaging videos, ship facts and more details about the interiors created by Adam D. Tihany and Bjorn Storbraaten. Tihany will also be joined by architect and designer Bjorn Storbraaten who will be bringing the ship to life in a familiar yet innovative style. With his previous work on ms Eurodam and ms Nieuw Amsterdam, Storbraaten adds continuity of the brand toms Koningsdam, while taking elegance to the next level. Over the coming months, even more innovative features and detailed renderings of ms Koningsdam will be released on the company’s website. Early season premier itineraries will be revealed in the coming weeks, in advance of these first ms Koningsdam sailings opening for booking on Dec. 1.
ms Koningsdam will be carrying 2,650 passengers once it makes it debut in February 2016.